In 2016, assisted suicide bills initiatives have already been defeated in Arizona, Colorado, Hawaii, Iowa, Maryland, Nebraska, New Jersey and Utah. There have been several groups that have been effectively working to defeat these bills, including state groups opposing assisted suicide, medical associations, local and national disability rights groups including Not Dead Yet and DREDF and groups such as the Patients Rights Action Fund. Many caring people gave testimony before State legislative committees concerning the dangers of legalizing assisted suicide. The Arizona assisted suicide bill was defeated in the Senate's Health and Human Services Committee. The Colorado assisted suicide bill failed in the Senate Committee and the Colorado Assembly didn't take up the bill because it lacked support. Also the Colorado Title Board decided not to advance a ballot measure that to legalize euthanasia and assisted suicide. The Hawaii assisted suicide bill was not heard by the Senate committee. The Iowa assisted suicide bill was stopped in the Senate sub-committee. The Maryland assisted suicide bill was withdrawn after the sponsor recognized that the bill was going to be defeated. The Nebraska assisted suicide bill was defeated after a tie vote in Committee. 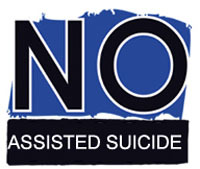 The New Jersey assisted suicide bill was withdrawn when the sponsor realized that the bill did not have enough support. The Utah assisted suicide bill was sent back to the rules committee. The assisted suicide bills in New York and the District of Columbia are the remaining threats. The California legislator passed the assisted suicide bill by subverting the legislative process in a 'Special Extraordinary Session.' Since the Extraordinary Session has not closed, therefore the California assisted suicide bill is not in effect. Further to that, based on California law, the assisted suicide law will go into effect 90 days after the closing of the Extraordinary Session. Therefore assisted suicide is not currently legal in California.